Facing drastic cuts on pageviews and ultimately revenue, content mill Demand Media announced on Monday that they will cut down on the number of eHow related articles they create and instead focus on lengthy articles written by journalists with at least five to ten years in the industry. In an email to contributors Demand Media in no uncertain terms said they will now focus on content with better-quality rather than mass-producing output. The announcement comes nearly six months after the Google “Panda” algorithm rolled out to lower the rank of content farms that mass produce content without necessarily having the “authority” necessary to do so. Looking ahead, as we continue to publish articles for eHow and our other sites, we want to be sure we are building on what already exists, not replicating it. This is not to say we will stop assigning standard titles in How to and Topic View format for eHow.com. But it does mean that we will have fewer eHow.com assignments for the foreseeable future. 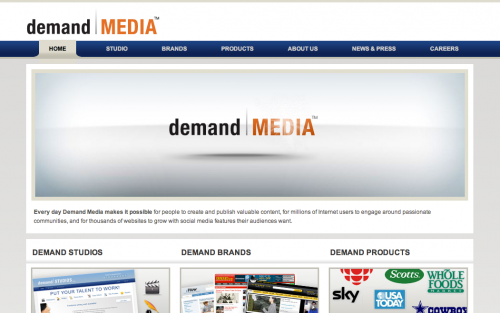 Demand says their best ranked freelance writers will remain in their program to help create the best content available, while others will be pushed to the side. If Demand Media continues to pay their more experienced writers at $15 per article for longer works I give the company 12 months before their selling off their assets. If nothing else their best writers might finally have a reason to ask for more cash per contribution. Personally if I was Demand Media CEO Richard Rosenblatt I would be focusing more of my efforts on niche websites and building more third party relationships such as the company’s partnership with USA Today. Given the massive contributor base for the company they could also easily jump into the hyperlocal market by extending their product line to include more local offerings. Do you think Demand Media can climb out of their funk and begin trending upwards once again? Definitely a reaction to the Panda update by Google.